The Book of Mormon is the keystone of the LDS religion. It is declared to be a literal record of the original inhabitants of the Americas, as recorded on gold plates. The thesis of the Book is that the American Indians are of Hebrew origin, descended from the lost tribes of Israel. The narrative contains numerous unique stories and fantastic claims, which are increasingly being tested against well-established history and science. Accepted by Mormons today as the most important scripture, the Book of Mormon contains surprisingly little doctrine related to the LDS Church; and Joseph Smith himself seldom referred to the Book of Mormon in his lectures. Few members are aware of the numerous 19th century books published prior to the Book of Mormon which bear striking resemblance to Joseph’s work. While much speculation revolves around how the story actually came to light, the critical question remains – was it actually written by literate Christian/Hebrew American Indians in an undiscovered language and location, using a method of inscription upon metal plates which also remains unknown in the old and new worlds? In the 1842 Wentworth letter, Joseph Smith suggested, “the history of ancient America is unfolded” in the Book of Mormon. Modern-day leaders continue to reiterate that the Book “…recounts the history of a group of Israelites that lived in Jerusalem…contains a history of the ancient inhabitants of the Western hemisphere” (Todd Christofferson, Library of Congress, Dec 7, 2016). While the Community Christ (RLDS Church) has permitted “faithful dissent” among its members regarding the historicity of the Book of Mormon, emphasizing instead its value from inspirational stories, the LDS Church remains committed to a literal interpretation. In light of the mounting evidence, faithful members must seriously consider if in fact sophisticated pre-Columbian Indians recorded the story. 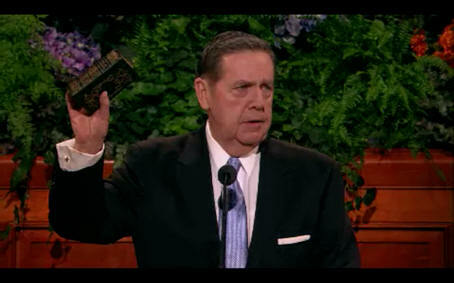 “There are three ways in which the Book of Mormon is the keystone of our religion. It is the keystone in our witness of Christ. It is the keystone of our doctrine. It is the keystone of testimony” (The Book of Mormon – Keystone of Our Religion, Ezra Taft Benson, Ensign, Oct 1986). “The Book of Mormon is the keystone of our testimony. Just as the arch crumbles if the keystone is removed, so does all the Church stand or fall with the truthfulness of the Book of Mormon…so does our claim to priesthood keys, revelation and restored church… Either the Book of Mormon is what Joseph said it is or this Church and its founder are false, fraudulent, a deception from the first instance onward” (True or False, Jeffrey Holland, 1994). “For 179 years this book has been examined and attacked, denied…yet still it stands. None of these pathetic answers withstand examination. There is no other answer… if anyone is foolish enough to reject 531 pages…teeming with literary complexity…Such persons have been deceived…if they leave this Church, they must do so crawling over, under, around the Book of Mormon to make their exit” (Safety For The Soul, Jeffrey Holland, LDS General Conference, Oct 2009). “It is not necessary for me to suggest that maintenance of the truth of the Book of Mormon is absolutely essential to the integrity of the whole Mormon movement, for it is inconceivable that the Book of Mormon should be untrue in its origin or character and the Church be true” (Studies of Book of Mormon, B. H. Roberts, 58). When Church Historian Leonard Arrington was asked if there really were Lamanites, he replied “Well, let’s put it like this; that is part of the great Mormon myth that we all hold to and all benefit from” (Leonard Arrington: The Writing of Mormon History, 129).